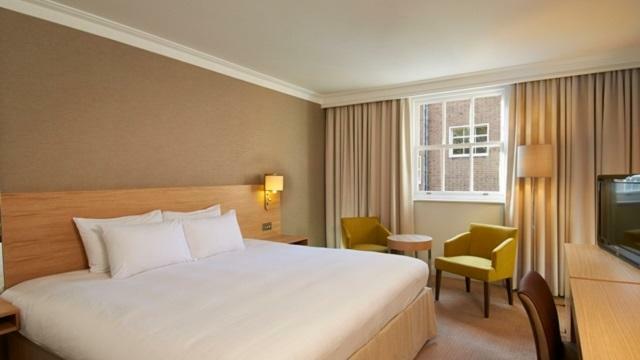 Charming & chic, Hilton London Euston with its 150 Guest Rooms and 11 Meeting Rooms accommodating up to 110 delegates, is a home away from home located in the historic Bloomsbury. The British Museum, Oxford Street, fashionable Covent Garden and enchanting Theatreland are all within walking distance. Fantastic links via underground, bus and train to all areas of London, will allow you to enjoy the capital at its best. With spacious Guest Rooms, your comfort is taken care of. Its contemporary style ensures you are relaxed and feel at home. Woburn Place Dining Room - For pleasure or business, lunch or dinner, our Woburn Place Dining Room serves classic English, Continental and Far Eastern cuisines, enhanced with our Chef's contemporary zest. With its Victorian conservatory, this sophisticated restaurant gives our Guests something to remember. Mulberry's Restaurant - Enjoy our Hilton Breakfast in the Mulberry's Restaurant. This delightful restaurant also hosts lunches for our in-house Conference delegates and Private Dinners. Woburn Place Bar & Lounge - With its relaxed environment and artistic interior, Woburn Place Bar & Lounge is ideal for lunch breaks and informal get-togethers. Euston - 2 min walk Exit underground/Main line station towards Euston Road, cross over by traffic lights into Upper Woburn Place. Is Hilton London Euston your business?